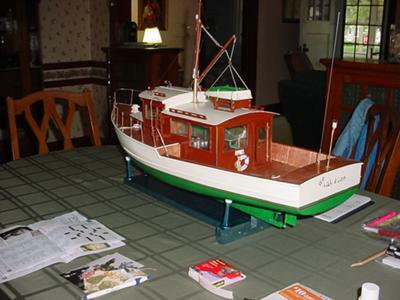 After months of looking around and not finding what I'd like to build, but finding pictures of old cabin cruisers (circa 1920-1930) and a fiberglass hull from New Brunswick, Canada, that I could convert, I began work on my own design, kind of a cross between a lobster boat and a bridgedeck cruiser. 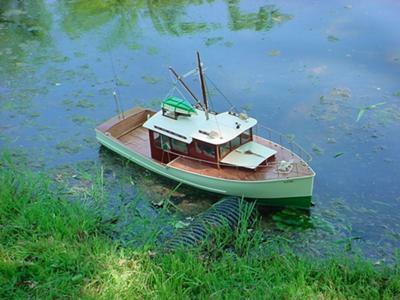 With modifications to a fiberglass hull and a mental picture of the final scratch built entity, I spent almost three months, working as little as a half an hour and as much as seven hours in a day to bring her to where she is today. She sports a 4-channel r/c system, which controls speed from a home-built speed control, for forward and reverse movement, steering, internal cabin lights and external running lights, all controlled by the transmitter. The dinghy was a full size set of plans from the internet, when downloaded, printed out to the exact size I needed. The Lady Alice has a crew of three and the cabin sports a camper like bed/dinette, a sink/stove/cabinet combo, swiveling boatswain's chair and helm. There is also a hatch to the forward sleeping quarters next to the helm. She also has a floating life ring and four floating fenders. Lynn, she is beautiful! Congratulations on a job well done! I'd be more than happy to keep in touch with you on this hobby. I first found a site over 10 years ago, 44MLB, which helped me get ideas to rehab and add more scale items to a U.S.C.G. powered lifeboat that I have. This was out of Norway. Since then I've been contributing when possible to other sites, such as Model Boat Mayhem, rcgroups.com, Wisconsin Scale Boating Association and lately The Hull Model Boat Group. Be patient with me, as I have an in home business that takes up a lot of my time, so my answers may not come quickly. This is a beautiful craft, such a pity that the kit manufacturers can't come up with something to compare. You must be justly proud - thanks for sharing the images with us. I would be very happy to talk more about modeling. I've been at it since a kid and I'm now 69. I am currently working on another model of my own design, again based on 1920's cabin cruisers. If you'd like to keep this more private, you can email me at lcleaich-at-yahoo.com. The new build is progressing and continually updated on RC Groups under Crazy Yank build. 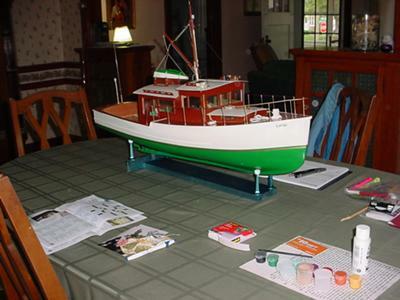 I'm new at model boat building and this is the first time I've clicked on this link. 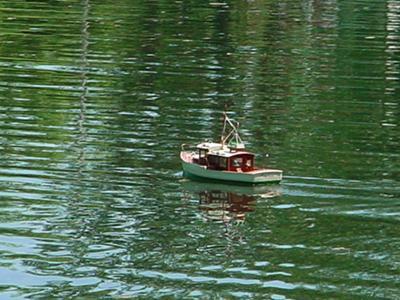 Can I email you to chat about your model boat?